Deco M5 uses several units working together to replace your router and create seamless Wi-Fi in every room. ART automatically chooses the clearest path for all the devices in your home based on the location of each Deco unit. No matter where you are, you always have the best possible connection, all through a single SSID (network name). Whether it’s 2.4 GHz or 5 GHz, ART places your devices on the right band based on the device and what you’re using it for. With ART, youre free to move from room to room as you stream, game, download and browse—all on a seamless Wi-Fi connection. Deco uses ART (Adaptive Routing Technology) to deliver the fastest Wi-Fi possible to each device. As more devices connect to your network, Deco balances the demand by finding the best path to send information across your home. With Deco and ART working together, youre free to move from room to room as you stream, game, download and browse—all on a seamless Wi-Fi connection. 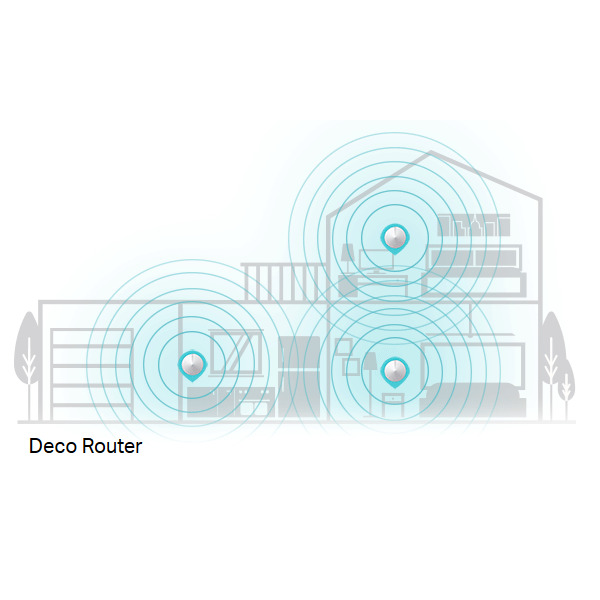 Allows you to quickly and easily install and manage your Deco Whole Home Mesh Wi-Fi System. Now, you can monitor your home Wi-Fi from anywhere, and make changes right from your smartphone or tablet. A set of three Deco units covers most homes (up to 5,500 square feet). The units work together to create fast, reliable and seamless Wi-Fi. At last, you can stream, game and browse in any room—even your basement or attic! To set up your Deco network, simply plug one of your Deco units into your modem and follow the instructions in the Deco app. The app also helps you find the best spots in your home to place additional Deco units. Once your Deco network is up and running, you can enjoy faster, stronger Wi-Fi connections that won’t drop out, even when you’re moving from room to room.